Introductory long division worksheets, long division worksheets with and without remainders, long division with decimals. 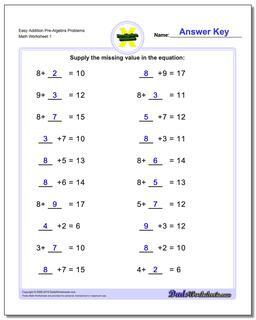 All of these long division worksheets includes detailed, expanded answers. 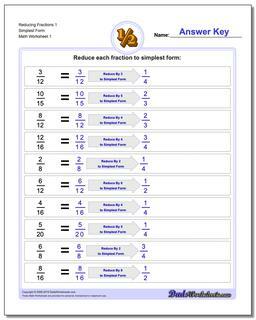 Practice worksheets for reducing fractions. Different fraction worksheets in this section deal with reducing simple fractions, improper fractions and mixed fractions. Practice worksheets for comparing fractions. The fraction problems on these sheets require kids to compare like and unlike denominators, improper fractions and mixed fractions. 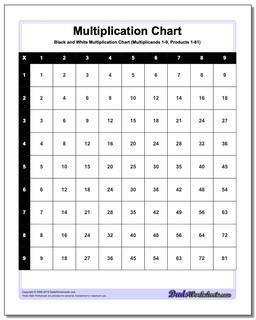 Worksheets for adding fractions with common denominators, with unlike denominators, as simple fractions and as mixed fractions. 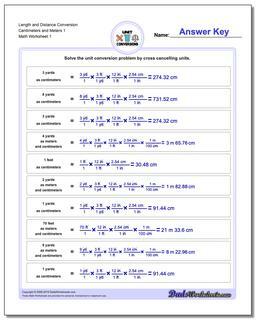 Complete work with steps is shown for each problem on the answer keys. 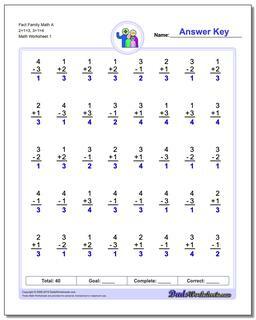 Worksheets for subtracting fractions with common denominators, with unlike denominators, as simple fractions and as mixed fractions. Full answer keys that show work! 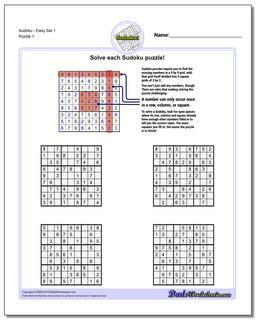 These math worksheets provide practice for multiplying fractions. Includes problems with and without wholes, and with and without cross-cancelling. 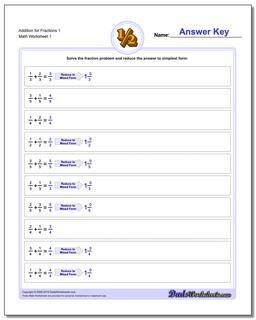 Every PDF fraction worksheet here has a detailed answer key that shows the work required to solve the problem, not just final answer! 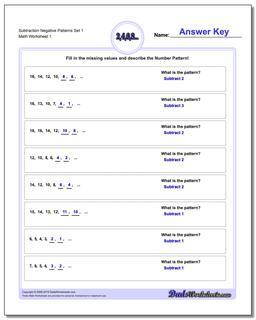 Dividing fractions worksheets with two fraction division. 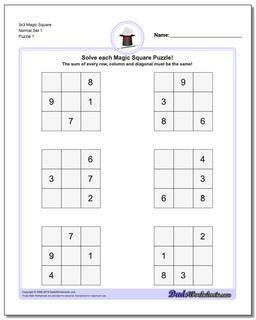 Includes simple fractions, mixed fractions and improper fractions, as well as problems that make use of a cross multiply step to solve. 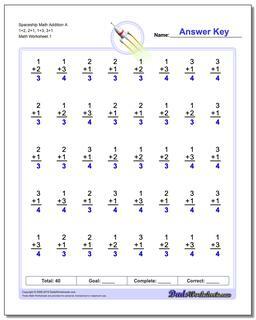 Worksheets for transforming fractions into decimals, including by the use of long division. Pre-algebra addition, subtraction, multiplication and division word problems dealing with relationships between numbers in simple equations... A great first step for easing into algebra! Worksheets that teach basic investing math concepts, including market capitalization, price-to-earnings ratios, dividends. 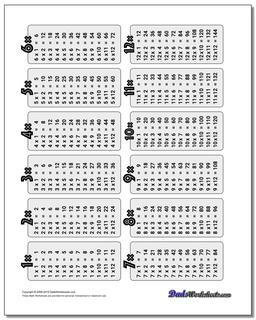 These negative number worksheets combine negative numbers with other integers (both positive and negative) using the basic math operations, multiplying multi-digit negative numbers, and long division with negative numbers. 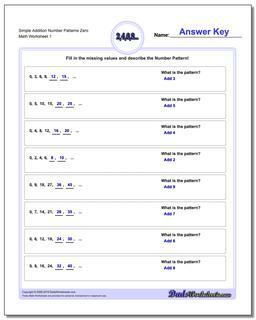 Worksheets to practice using and calculating percentages of other numbers, including converting between fractions and percentages. 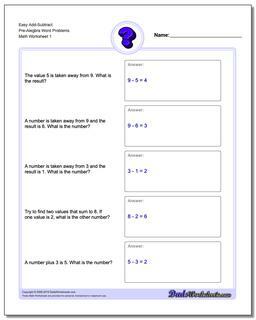 These number patterns worksheets help students develop the needed skills for determining patterns and relationships between numbers. Number patterns that cross zero and may start or end with negative values. 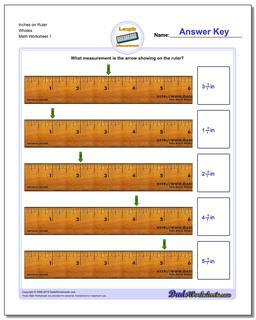 Worksheets for determining the mean, median, mode and range for sets of numbers. 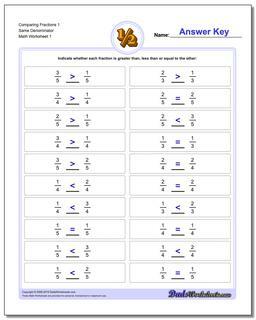 Problems include sets of all positive integers, all negative integers and mixed sign sets, plus calculator practice. 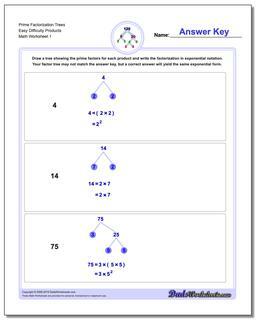 The printable prime factorization worksheets on this page require students to factor progressively larger integers into their prime factors. This is the first step for determining the greatest common divisors of two numbers, or determining the least common multiple of two numbers, but additionally prime factorization introduces the concepts of prime numbers and composite numbers. Pre-algebra skills including solving for the missing values. 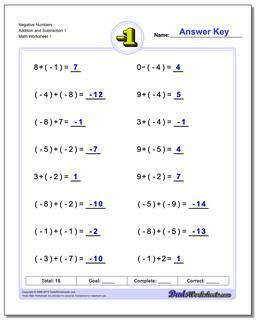 These order of operations worksheets mix basic arithmetic, including parentheses and exponents. 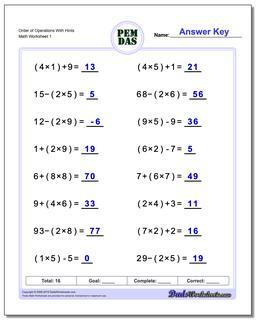 If you are looking for order of operations worksheets that test knowledge of the PEMDAS rules, these math worksheets are a good start. 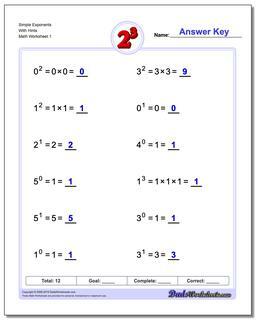 You can also find order of operations worksheets with negative numbers and order of operations worksheets with comparisons at these other worksheet pages. The blank coordinate planes on this page include variations with labels on either the axis or the edge of the grid, as well as versions with quadrant labels. 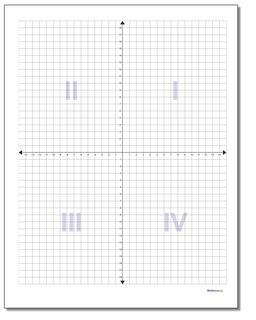 You can find full 4 quadrant coordinate planes, as well as just blank 1 quadrant coordinate planes in layouts setup for solving multiple homework problems on a single page. 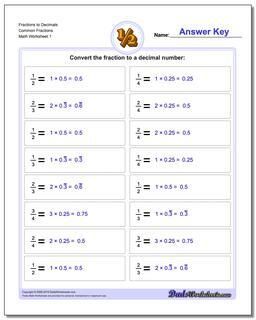 These worksheets use unity fractions to convert unit values from one measurement to another. This approach is more common in chemistry, physics or other science classes and requires students to focus on cancelling units to reach a solution with both the right value and the right units. Customary unit conversion practice for distance (inches to feet), volume (ounces to gallons) and mass (ounces to pounds). 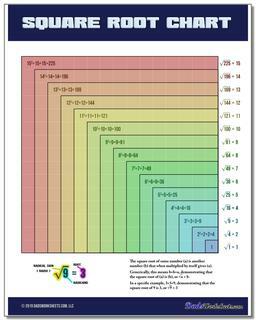 These worksheets also employ unity fractions to convert unit values from one measurement to another. This approach is more common in chemistry, physics or other science classes and requires students to focus on cancelling units to reach a solution with both the right value and the right units. These worksheets use unity fractions to convert values between SI (Metric) units and customary units. Topics in this section include conversion practice for inches to meters, liters to gallons and grams to pounds. 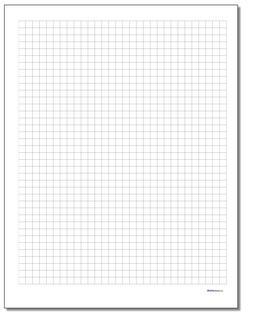 Whether you're looking for a list of perfect square roots, or a complete table of square roots from 1 to 100, a square root chart from this page will have your radicals covered! 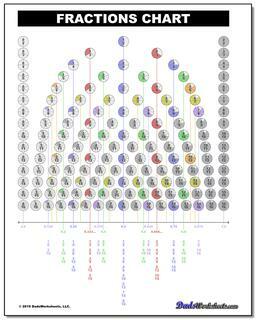 There are both color and black and white versions of the charts in printable PDF form. This unique rendering of equivalent fractions combines the value of the fractions positionally on the number line to create an elegant symmetry. It not only highlights fractions in their lowest, most reduced form but provides a convenient decimal equivalent for the most commonly used fractions. This really is one of the nicest reference charts I've created in the 10 years I've been building math resources! Sixth Grade! Almost ready for Middle School! But that doesn't mean it's the end of math practice, no indeed. These sixth grade math worksheets cover most of the core math topics previous grades, including conversion worksheets, measurement worksheets, mean, median and range worksheets, number patterns, exponents and a variety of topics expressed as word problems. Students in 6th grade should have an outstanding mastery of their math facts and be able to complete timed addition, subtraction, multiplication and division tests rapidly and with near perfect accuracy. Students in 6th grade should also be comfortable with fractions, and the topics convered on the fraction worksheets on this page should be familiar. With confidence in these math topics, students in 6th grade should be ready for pre-algebra as they move on to the next part of their discovery of mathematics.